Abena Apam had a problem. Business was down. Sales were slow. No one, it seemed, wanted to buy her soft drinks, bottled water, or other goods. Why? With no electricity, Abena could not keep her products cold. Her customers, villagers and workers in the small cocoa farming community of Katapie, in Ghana’s Ashanti Region, wanted cold drinks in the hot weather. She needed a plan. She needed electricity. Enter Black Star Energy (BSE), an off-grid electricity company based in Ghana that develops and installs solar mini-grids to increase access to affordable and reliable power in rural and remote communities. When BSE deployed a mini-grid in Katapie in August 2017, Abena finally had the round-the-clock electricity she needed to keep drinks cool. Abena bought a freezer and expanded her shop to twice the original size. She even extended her operating hours into the evening, and has increased her sales by 400%. 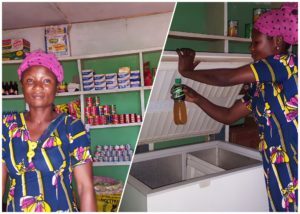 With business booming, Abena now wants to add another freezer and develop a wholesale line to supply goods to other provision stores in the community. Abena’s story illustrates the findings of a study conducted in collaboration between Power Africa and Energicity, BSE’s parent company. Energicity and BSE wanted to understand the impact of electricity on communities, with a particular focus on understanding the impact of solar mini-grids on women’s entrepreneurship and women’s incomes. In most cases, women in the communities surveyed had long held dreams of starting businesses. However, without electricity the obstacles were too great, or the business operating costs – including diesel generators – was too high. With the provision of electricity, women across BSE’s service area made similar choices to start businesses. In fact, 29% of the women surveyed said they decided to start a business after electricity was provided in their community. For example, Ajara Ibrahim started a business selling fish in her remote community before there was electricity. She would travel 15 miles to buy a small stock of fish and bring it back to the village. If there were unsold fish at the end of the day, she would smoke the remainder to preserve her investment. However, between the costs of travel, difficulty getting the right amount of inventory, and the low consumer interest in smoked fish, she ultimately gave up on the business and went back to helping her husband on their farm. 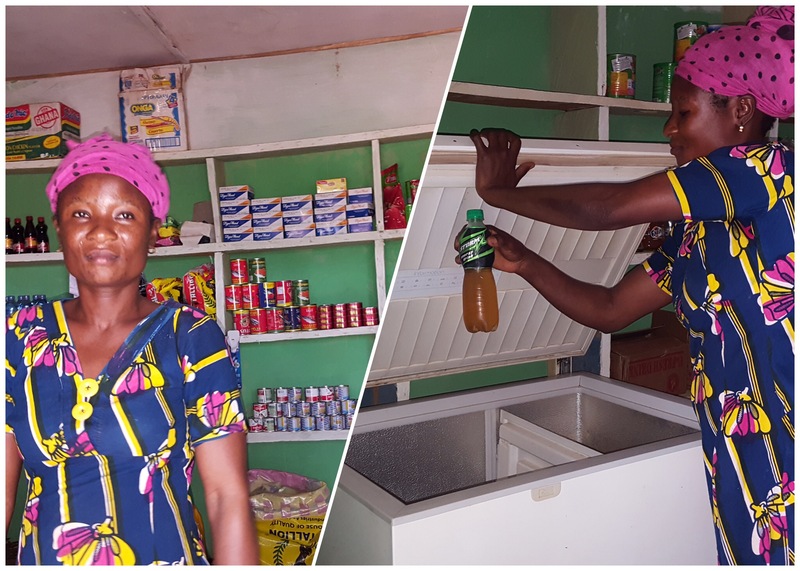 Once Black Star Energy started providing electricity in her community through a solar mini-grid, Ajara got a freezer through Black Star Energy’s freezer leasing program and restarted her business. Her business now is generating an income of about $2.2 per day, about five times what she was generating with her previous business. Survey data supports Ajara’s story, and shows that a dramatic increase in women’s incomes is possible with electricity. Before electricity, 90% of the women entrepreneurs surveyed had incomes of less than $2.00 per day. After electricity, 75% make incomes of more than $2.00 per day, with 32% earning $10 per day or more. Put another way, 95% of entrepreneurs making less than $1 per day have no electricity, while 100% of entrepreneurs making $10 or more per day have access to electricity. The women entrepreneurs surveyed have increased their incomes by up to 11 times. This income boost alone is phenomenal, but that they are going from extreme poverty to near middle class while staying in their rural communities is awe-inspiring. This survey is only a beginning. While the sample size is a relatively large percentage of BSE’s customer base (15%), to have conclusive determinations on whether energy access really does drive increases in women’s incomes by up to 11X in less than two years would require a much larger sample. However, we hope that this study inspires development finance and impact finance providers to look more closely at the intersectionality of electrification and other development impacts. High-quality electricity access (tier 3/4) via mini-grids should be seen as one of the most important levers to improve not just quality of life by providing light, but also by driving significant advances in income potential, gender equity, and across-the-board development. The World bank considers living under $2 per day extreme poverty and $13.50 per day is considered to be the emerging middle class. Self-reported answer to questions: “Before electricity how much were you making per week from your business?” “After electricity, how much are you making per week from your business?” Possible responses: 10-50GHS per week, 50-100 GHS, 100-300GHS, 300+ GHS. Calculations of USD/ day based on midpoint of range at current exchange rate of 4.90GHS/ USD.